In some of my recent reviews I’ve mentioned how some games feel a bit like mobile games, but now I have come to the pinnacle of “this game feels like it belongs on smartphones” That game’s name? Shut the Box. 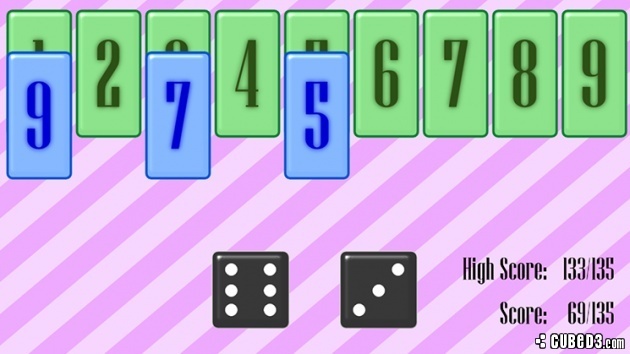 Shut the Box is so simple that the entirety of the gameplay is summed up on one screen that shows once you start the game. Your goal is to clear a row of cards listed 1-9, and clear two more identical sets of cards 1-9 right behind the first row. You press the ‘roll dice’ button and then two virtual dice are rolled. Select any number of cards that add up to your dice roll. There’s absolutely nothing good to say about the graphics; it looks terrible, even for a simple card game. Wait, it gets worse; the in-game music has to be one of the worst video game tunes I’ve ever listened to. It’s the same twenty-second sound playing on loop, and it’s awful. I had to turn the volume off because I thought my ears would start bleeding. Now here’s where you might be thinking, “The gameplay surely can’t be as bad as everything else, can it?” Oh yes it can, in fact there is little to zero strategy to Shut The Box; your three year old cousin could come up with the same strategy you do. Maybe you can carefully choose which cards to get rid of first, but in the end it’s all blind luck. If you somehow manage to play enough to the point where you get a perfect game, you’re awarded with dancing cards and a generic “perfect game!” message. It gets worse; your high score saved doesn’t change when you get a perfect score, so the little bit of satisfaction I had from winning was taken away. Shut The Box doesn’t belong on a Nintendo platform; it’s exactly like a smartphone game; a bad, free smartphone game. Sure it could entertain your Grandma, but any gamer will find nothing exciting about Shut The Box. This review probably makes me sound bitter, and maybe I am. There are some awesome indie games being made for Wii U, and then you see games like Shut The Box, that gives indie developers a bad name. Sure some casual gamers could find this fun and it is at a very low price, but I don’t think Shut The Box is worth purchasing. If you must play Shut The Box, I would bet there is a very similar game on mobile or online for free. It's a shame because Blok Drop U is a great game and Poker Dice Solitaire Future was a decent game, but this game sounds like it isn't anywhere near the same quality as the other two games developed by RCMADIAX. Anyways thanks for posting yet another great review article. After Blok Drop U this developer seems to be getting worse and worse. Thanks, guys! I think with every review I've written I'm giving less and less ****s and just speak my mind. I sure did with this review. You seem like a very honest reviewer which is very important. thanks, I hate giving harsh reviews because developers put a lot of hard work into games, but I must be honest, because that's exactly what my job is. If you lie to your readers about a game, how will they trust you? I'm glad that I didn't download this game, but man I wasn't expecting such an abysmal score. That's the way reviews should be handled. You'll go far as a journalist with that attitude, great review btw. Honestly if the music wasn't so bad I would've given it a much better score. The fact that I actually had to mute the volume to stand playing Shut The Box shows something about the game as a whole. Also, if there is one thing to get right about board/card games, it's the music. @Gamergy wrote: Honestly if the music wasn't so bad I would've given it a much better score. The fact that I actually had to mute the volume to stand playing Shut The Box shows something about the game as a whole. Also, if there is one thing to get right about board/card games, it's the music. I agree games like this need a good soundtrack otherwise they are just a board game that would be more fun to play for real instead of digitally. Some of the official Monopoly video games are an exception to this general rule. Beautiful review Gamergy, hopefully your next game will be better! You're a man of honour! Good review this game shoulda been much better then it is.